As a kid, I can remember always looking forward to licking the beaters after my mom made chocolate chip cookie dough. It wasn't until much later that I realized that it wasn't just me who thought the dough was more satisfying than the baked cookies and that many women people prefer it that way, salmonella and all. I'm sure many of you have seen chocolate chip cookie dough dip floating around on some of your favorite blogs. This recipe is based on that creation, but with toffee bits used in place of chocolate chips. They add a buttery crunchiness that I find superior to plain morsels. I also added a bit more powdered sugar, and what I ended up with was something more akin to a spread than a dip. If you want a softer bowl of goo, go with the lesser amount of powdered sugar. Either way, though, you won't be going in a bad direction. Bonus: There are no eggs involved here, so salmonella is off the table. In a small saucepan, melt the butter over medium heat. Whisk in the brown sugar until it dissolves and the mixture starts to bubble. Remove from heat, stir in vanilla, and let cool. In a separate bowl, cream the cream cheese and powdered sugar together for 60 seconds. With the mixer on low speed, add in brown sugar and butter mixture. Mix until combined. Stir in the toffee bits. Serve with 'Nilla wafers, gingersnaps, or graham crackers. Anything, really. That dip is wonderful! I really like the idea. I still let my kids lick the beaters. Salmonella be damned! I have just the cookies I need for this dip or spread. I feel like such a freak because I have never liked cookie dough or cake batter! I hate that raw flour flavour. Ho do you feel about it being served with shortbread? Fantastic!!! I love cookie dough, and really don't give the whole salmonella thing a second thought, but it would be nice to play it safe! @Lisa-Marie: i think that sounds like a great idea! Yep, guilty as charged. I've always liked the dough more than the cookies. This dough dip would be a dangerous thing to have in my house! Problem with this is... I would probably eat the whole bowl in one sitting. Is it just me or is that last little cookie dough sandwich sticking out its yummy tongue at us? I would ALWAYS rather eat cookie dough than cookies...it's a problem. This dip...a definitely problem. In the best possible way. Well, that's a brilliant idea. I almost wish I hadn't visited you today, Grace. :) One thing I don't need is another irresistible way to consume calories. While I don't crave chocolate chip cookie dough, toffee pieces are another matter entirely. Giada makes a refrigerated apricot nut cookie (one of my favorite recipes) that rarely makes it to the oven as I keep taking chunks of it raw right out of the fridge. And yes, there is an egg in it. I too consider dough to be more satisfying than baked cookies. Does it get much better than this? Amazing! I've always been the weird one who doesn't like cookie dough (or cake batter!)......haha. Though this dip sounds really interesting! Miss you, Grace! Hope you're doing well! When I was a kid I never thought about salmonella. Weirdly enough neither my mom was thinking about it and when she was making a cake she always kept the two last spoonfuls of the batter for me and her! Now I wouldn't even think of doing it lol! This dip though sounds like fun and most of all safe! Ohhh.... I love the addition of toffee chips! I could literally eat a bag of those beauties on their own merit. Nice dip Grace! hehe...I know, I always enjoy the cookie dough than the baked cookies. Same as my baby girl. I love that you used butterscotch chips to replace the chocolate chips, I love that crunch too. This definitely is a fun and delicious dip! Oh goodness this dip sounds amazing! It seems like dips are all the rage these days. Mmm. Sorry I have not been by much. I'm getting caught up on my blog reading now! I didn't have much time in school. I would eat that dip every day if I could! 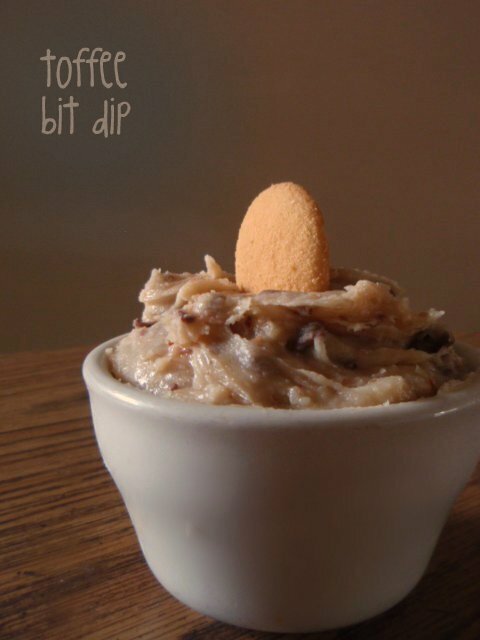 At the beginning of this post I was worried; a friend of mine went on and on and on about this chocolate chip cookie dough dip she found on pinterest. And! it was healthy! because it was made with a chickpea base. Chocolate chip cookie dough should not have a chickpea base. It was so awful. So so so awful. Your dip, meanwhile, looks tasty! Especially wedged in between some cookies.